Last month, we launched the second installment of our digital dialogue series called #OpportunityRedefined, which seeks to lift up amazing leaders and ideas, provoke conversation, and incite boldness in addressing the toughest challenges we face in America. 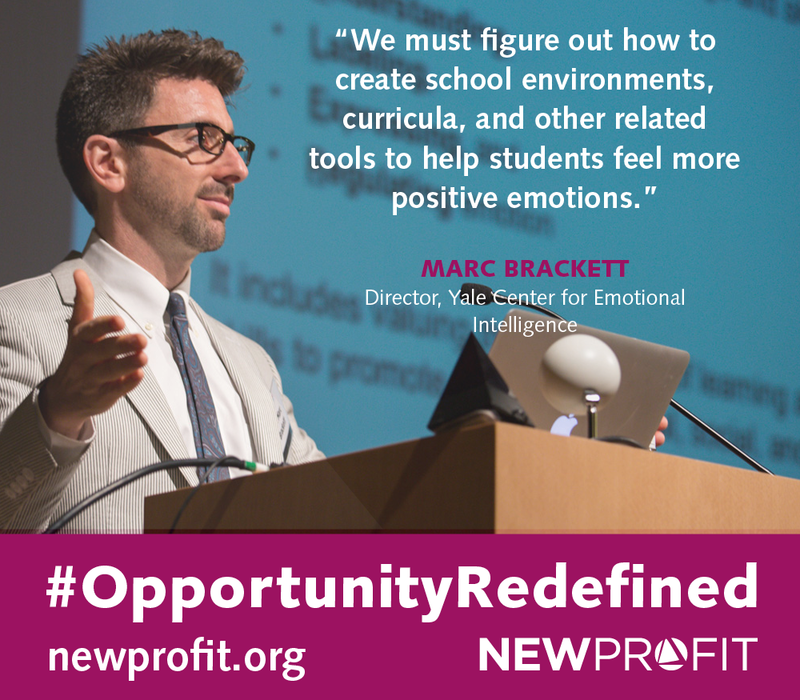 Right now, we're focusing on how advances in behavioral science are changing social problem solving, and we’re excited today to publish an interview with Marc Brackett,Ph.D, Director of the Yale Center for Emotional Intelligence. What big social challenges are you most focused on solving? The largest social challenge we face is that social and emotional learning is not on the national agenda. It’s an idea that people think is important, but it’s not something that’s part of traditional education. It’s a problem because having great ideas that are not mandated to be part of the curriculum make them seem ancillary. Decades of research show us that emotions matter, particularly in schools. They matter for attention, learning, relationships, mental health, and academic performance. If children aren’t aware of their feelings and can’t manage them effectively, they won’t achieve their full potential. What are your core areas of research right now? At the Yale Center for Emotional Intelligence, we have a wide range of research projects. We are studying why emotions matter through looking at what emotions our youth experience in school, why they experiencing them, and how those emotions affect decision making, relationships, and academic performance over time. We are also studying, and trying to build measures around, emotional intelligence. RULER, our evidence-based approach to teaching social and emotional learning takes the lessons we’re learning and deploys them to schools to help teachers integrate emotional intelligence into their everyday work. RULER is active in hundreds of schools. We are fortunate to receive feedback from our clients so we can learn the best ways to teach emotional intelligence and assess skill development over time. What transformative insights have come into view for you most recently in each area? The finding that stands out most in our recent research is that students are reporting experiencing very strong negative emotions in school. That’s an alarming finding and as a nation, we need to figure out how to create school environments, curricula, and other related tools to help students feel more positive emotions. The research on students’ emotions was part of the Emotion Revolution, our collaboration with the Born This Way Foundation, founded by Lady Gaga to highlight the critical role emotions play in young people’s learning, decision-making, academic achievement, and overall wellness. We surveyed 22,000 high school-age youth (see more survey findings here). Can you provide a human anecdote to show how the interventions impact people's lives? Recently, we got a note from a RULER partner school about a reaction one boy had to problems in his family. He was sitting in his bedroom and listening to his parents fight and yell and scream at his brother. The brother was eventually sent to his room crying and it was a family disaster. The first boy sat down and wrote his brother a note about how he could reappraise the situation in order to manage his emotions around it more effectively. He slipped it under his brother’s door for him to read and so eh would have the support he needed. Later that night, the parents found the note and were blown away and devastated about the fact that their children were having to help each other cope. This was an affirmation for us of what it means to have these skills at hand. Too few kids and adults have them. From a practical standpoint, how do you see these insights being deployed for social problem solving? Our focus now is on scaling RULER. We are figuring out ways to not only work directly with schools, but also how to collaborate with youth-serving organizations like Playworks to train their leaders to deploy social and emotional learning. Those partnerships are just as important as our school-based work, because social and emotional learning has to be taught holistically for it to be successful. The Emotion Revolution is one of the most exciting research projects right now. We are continually gaining insights from our analysis of the high school student survey which captured the emotional lives of over 20,000 students. We are also partnering with Facebook to build an open source resource center for high schools to support teaching social and emotional learning and pilot our approaches. Everything we are doing is co-developed with youth who are experiencing these issues. We believe youth need a stronger voice in building more positive schools.